Digital Textile Printing using Pigments offers companies large and small the commercial freedom that they need to succeed. Pigment Inks are the ink-choice of the worldwide textile printing industry. Reactive, Acid, Disperse and Vat ink systems all have their place, but the simple fact remains that Pigment printing is number one. In 2017, out of 32 billion square metres of Textiles printed by whatever means, over 25 billion square metres were printed using Pigment Ink technology. Of this figure approximately 1.8 billion square metres were produced using Digital Printing, but with a CAGR (compound annual growth rate) in excess of 15% the volume of digital textile printing is now expected to grow to over 2.5 billion square metres by 2021. 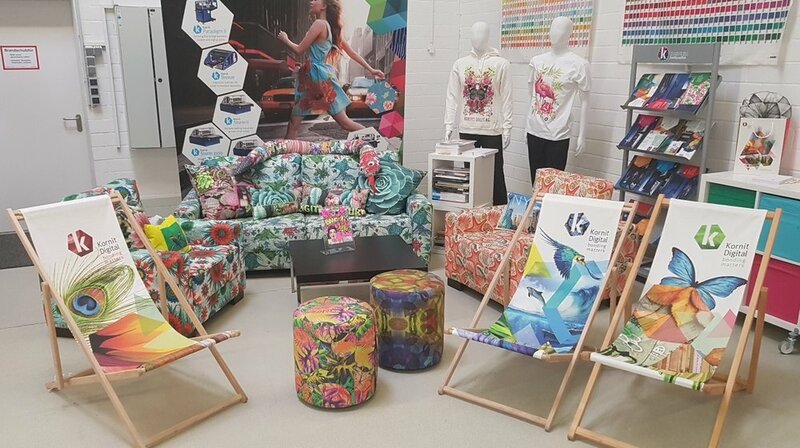 Yet as far as Digital printing is concerned, Pigment printing is only just starting to grow, with reactive and dye sublimation printing having previously dominated the Digital textile printing sector. With the exception of the direct to garment process, the early digital print head technology for roll to roll print production was unable to cope with the higher solids content of pigment colour at high speed. Therefore the early application of digital technologies concentrated on the Reactive and Dye sublimation printing sectors, where the water-based inks flowed readily giving reliable print performance. However, these early teething troubles with Pigments have now been overcome and the current prospects for growth are exceptional. The Kornit Allegro, single-process, print system offers an economical, hi-speed roll to roll digital textile printing machine of industrial quality using non-allergenic, sustainable inks. The Allegro offers complete integration with web-to-print platforms, an Eco-friendly - 100% waterless process, a fully automated in-line, production process cycle with no need to pre-treat fabrics prior to print. It is both versatile and economic, and marks a turning point for textile manufacturers who increasingly must now choose digital pigment print systems over traditional chemical dye systems and cumbersome analogue process. Pigment ink systems by their very nature use a simple combination of chemicals and colorants which are cheaper to produce than other ink technologies. The actual process cost of Pigment Printing, which is less involved and technical than the others, brings the relative cost equation out very much in favour of digital pigments. There is no doubt that printing with pigments is substantially less demanding than printing with other technologies. All the other technologies use complex colour development and post processing systems which are cumbersome, heavy in consumption of water and energy, and difficult to administer. Of all the available inks, Pigment is the only technology that gives the user an immediate product for approval. Using pigment inks there is no need for steaming and washing and drying. Pigments are the only ink technology where a printed fabric can be immediately approved on the printing machine with safety and confidence. Of all the benefits of Digital pigment printing, the most appealing, is that it is suitable for all Fabric Types, whatever their fibre composition. All of the other dyestuffs are focussed on a particular fibre group, Reactive Inks on Cotton, Disperse Inks on Polyester and Acid Inks on Silk, and any attempts to cross the boundaries into other fibres is not practicable. Digital Pigment Inks, because of their nature don’t differentiate between fibres. They are suitable for Linen, Cotton, Viscose, Polyester, Silk, Nylon and a variety of other fibres. Importantly, Pigment Inks are the only ink technology suited for non-homogeneous fibre blends such as Polyester-Cotton or Viscose-Nylon. This is because the pigment ink is deposited as a solid stain on the fabric and doesn’t rely on a chemical reaction to be fixed. Fibre blended fabrics account for over 60% of all Fabrics printed worldwide and Pigment printing is the favourite medium of manufacturers because of its adaptability across the fibre and fabric spectrum. The process for Pigment Ink printing is particularly economic in energy terms. Pigment printing only requires heat fixation and final finishing, whereas all the other Inks require either HT Steaming, washing-off and drying, or the use of costly media such as paper to complete the print process. These extra processes are very costly in energy terms and it is true to say, that on average, pigment printing uses less than 15% of the energy used by other technologies. Pigment Printing has immaculate environmental credentials, for it uses very little water, discharges no significant process effluent, and uses much less energy. For example, it has been calculated that to print and finish a metre of Reactive print, over 50 litres of water will be used, most of it to be raised to boiling temperature and to be discharged as effluent into the local environment. Pigment printing uses little or no water, there is no effluent discharge, and its use of energy is minimal, offering a practical sustainable solution to our environment. Pigment Printing with a market size of 25 billion metres per year, offers digital technologies the opportunity to make a huge positive impact in an established sector of the worlds textile market. For an industry that is challenged by ultra-fast delivery times, and “just in time manufacturing” the future is set for digital manufacturing. Pigment historically is the ink set of choice for the bulk of the Textile industry, and with established credentials and performance standards, pigment appeals to the manufacturing community. Faced with numerous commercial issues, for many textile companies, now forced to look to re-equip with the next generation of machinery, it’s a simple choice. Digital pigment printing services the five main fabric printing sectors: Fashion and Apparel, Soft Signage, Home Décor, Sportwear and Contract Décor, all of which are established markets for pigment printing. The consumer demands high volume industrial print, alongside speed, sustainability, efficiency, versatility, and flexible manufacturing. The textile sector now faces new opportunities and challenges that must be addressed and overcome.